The FIDEM medal exhibition has been moved to the Musée provincial des Arts anciens du Namurois (TreM.a - rue de Fer 24) in the city of Namur. A local television network has made a report on the FIDEM 2016 exhibition with an interview of Alain Fossion, curator of the exhibition. 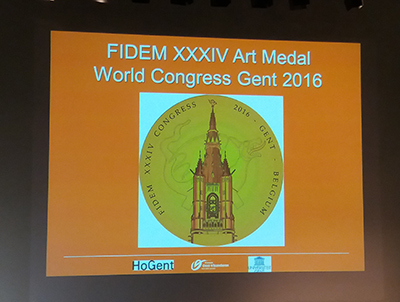 The XXXIV FIDEM congress was held in Belgium in the city of Ghent and wasofficially opened by the Deputy of the Province of East-Flanders, Mr Jozef Dauwe and the President of FIDEM, Philip Attwood. The later made an historical introduction speech. 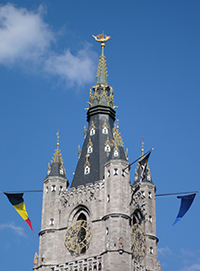 He refered to the 2nd FIDEM congress from 1939 which was held in Liège. This congres was held mainly by the medal manufacturersof the time. Since then the congresses have included the artists. To renew this old tradition, the theme of this year's congress has been on one hand the artists and the other the manufacturers. In 1939, 150 medals where shown as part of the art section the International Congress of Water. This evening the official openening of the XXXIV exhibition will show more than 900 medals. A commemorative plate of this congress was inaugurated during the official ceremony. 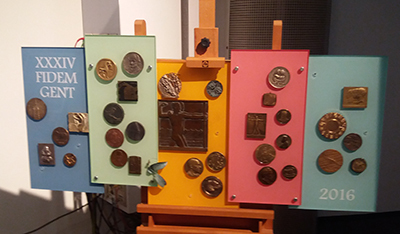 Paul Huyberechts explained that it is composed by 33 medals (number of countries participating), 5 coloured plates (continents) and the different materials used today to create medals. He hopes that the plate will find a place in the PAC building. A musical intermezzo followed was played by Monique Jobin and Yani Afrin before a coffee break. During the second part of the opening two lectures were held one was entitled: Collecting medals and the fate of the medal editors in Belgium and held by Johan van Heesch. 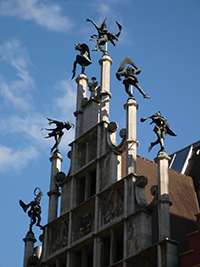 The second was entitled Geo Verbanck (1881-1961) - an extremely talented Ghent sculptor-medallist and was held by Anthony Demey. There is an article about the congress in Italian available online. Would you also like to share some pictures? Please contact the webmaster: e-mail: fidem_webmaster@yahoo.com.